With the Internet in your pocket, it’s hard to not take advantage of it in every situation possible. However, there are some instances in which iPhone use is limited—particularly if you’re behind the wheel of a car. Talking Email Keyboard from G.P. Imports attempts to change that by allowing you to type e-mails as you drive. You Tap, It Speaks: Talking Email Keyboard sounds out each letter as you tap out an e-mail, but playback can lag. That’s what the developer touts at the top of its App Store page for Talking Email Keyboard. (Its App Store listing even includes the words “Type while on the Road.”) And while that’s certainly an eye-catching claim, the app has more practical uses—as an audio helper if you’re not comfortable using the iPhone’s keyboard or if you’re visually impaired. Talking Email Keyboard works by announcing each letter you’ve typed after you tap a key, saving you the trouble of having to look down at the screen as you type—at least in theory. The voice used by the app is pleasant and can clearly enunciates whatever letters you type. However, when typing fast, the voice can lag, decreasing your productivity. Still, even with Talking Email Keyboard’s oral confirmation, it remains hard to know what you’re about to type without sneaking a peak at your iPhone. For instance, it’s impossible to know that you’re about to type the letter “y” until after you’ve hit the key and Talking Email Keyboard confirms it. It would be great if the app would announce letters as you scroll over them. The app also doesn’t announce any auto-correct words suggested by iPhone. And it doesn’t let you know when you’ve switched to the numbers/symbols keyboard. As I noted above, G.P. Imports touts this app as something you can use while driving “if your local law permits”—I wouldn’t recommend the app for that use no matter what your local laws are. That said, the app might be more appealing to visually impaired users who would appreciate the audio cues as they type. It certainly seems like a better use than having distracted motorists fumbling for their iPhones to tap out an e-mail when they should be focusing on the road. 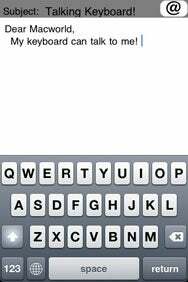 Talking Email Keyboard is compatible with any iPhone or iPod touch running the iPhone 2.x software update.